How to Get Free Apps without Password in iOS – iMobie inc. If you like to download free apps on iPhone/iPod/iPad, you may want to know how to set up your iPhone to get free apps without password. In this guide, we will show you how to make it with ease. Go to download this wonderful software to manage and transfer data on your iOS devices after reading this guide about allowing free app downloads without password entry in iOS. When you find a free app in the App Store and try to download it on your iPhone/iPod/iPad, a dialog will pop up and ask you to "Enter Password" before downloading it on devices. It may be a little bit annoying for you to enter password every time to download an app. 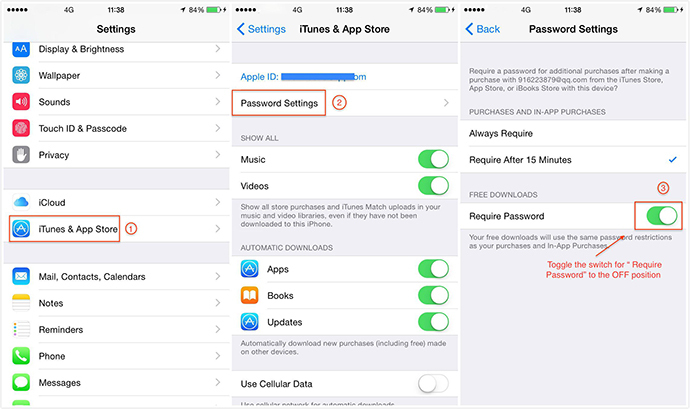 In this guide, we will show you how to download free apps without password in iOS. Note: iPhone/iPad/iPod touch should run the newest version of iOS. Step 1. Open the Settings app and Tap on "iTunes & App Store". Step 2. Choose "Password Settings" under Apple ID username. Step 3. Toggle the switch for "Require Password" to the OFF position under the "FREE DOWNLOADS". Note: If you enable fingerprints for iTunes and App Store purchases by going to Touch ID & Passcode > Toggle the switch for "iTunes and App Store" to the "On" position under "USE TOUCH ID FOR", you won't see the "Password Settings" option in iTunes & App Store. After setting up your iPhone/iPad/iPod touch as above steps, you can download free apps in the Apple Store without having to enter a password. If you download paid apps, you still need to enter password. In addition, if you want to transfer and manage your apps between two iOS devices, you can use AnyTrans to help you. If you still have any question about this guide, you can contact our support team via Email, they will reply to you within 24 hours. If this guide is useful for you, don't forget to share it with your friends or family.